DROP OFF IN THE TEACHER LOUNGE BY 10:30 a.m. Please volunteer to donate food or your time. Bring your best Spring ideas! Quiche, Frittata, Salads, ham, asparagus….whatever you fancy! State championship in Los Angeles NEXT! From psychology to computer programming, biology to physics, or math to engineering, each year with the coming of spring students across the country tackle science projects. The science fair has a long tradition in the West Contra Costa Schools, and Korematsu sent a large contingent of winners from our school fair onward this year. Held at El Cerrito High, the annual WCC Science/STEM Fair had 141 students from eight middle and high schools attending. We did very well again in 2019, snagging 28 of the 75 ribbons, plus several Special Awards. Korematsu notably won half of all the first place prizes at this year’s District ceremony! In 7th Grade at the District fair, First place awards went to Korematsu students: Meah Bauer, Eghosa Otokiti, and Sam Schweitzer. Second place winners included Taran Johnson, Amy Pebler, and Emilia Walker, with 3rd place prizes going to Drake Fillingim, Alma Hasley, Haroon Mishal, Gilbert Bade, Ana Lucia Elices , Matthew Parra, and Maeve Urban. And in 8th Grade, taking first place at the District were Rika Adam, Eleanor Addison, and Tess Roorda. Second place, prizes went to Grace Maguire, Deidre Miller, Cooper Matthews, Benjamin Pilling, Amelia Wardle Stacey, and Nora Thompson. Third place awards went to Theo Boyrs, Johan Phan, Sangye Richen, and Henry Warmerdam, while 4th place went to Liliana Arias Purcell and Mira Steinberg. Seventh graders Sam Schweitzer and Eghosa Otokiti, and eighth graders Tess Roorda and Rika Adam also received special prizes from Bio-Rad and $50 each, while Eleanor Addison received $75 and the Norm Seraphin Award, given in honor of a long-time El Cerrito science teacher. 1st (8th grade Biological) Eleanor Addison’s Sunscreen: Protection or Poison? 3rd (7th grade Physical) Meah Bauer’s How do animals keep warm in cold regions? 4th (7th grade Behavioral) Alma Hasley’s Do You Eat With Your Eyes? 4th (8th grade Behavioral) Tess Roorda’s Does Facial Appearance Affect Perceived Traits? Eleanor and Nora also received special awards from NASA and NOAA respectively. For the second year in a row, Korematsu will move on to compete with the top young scientists from 22 regional fairs across the state for over $75,000 in prizes. With support from the District our two top finishers, Eleanor Addison and Nora Thompson, along with one other student from West Contra Costa, travel to the 68th Annual California Science & Engineering Fair on Monday, April 29 and Tuesday, April 30 at the California Science Center in Los Angeles. Congratulations to all our hard-working young scientists! 1. Verify CURRENT address with your Elementary Secretary before June 7th. 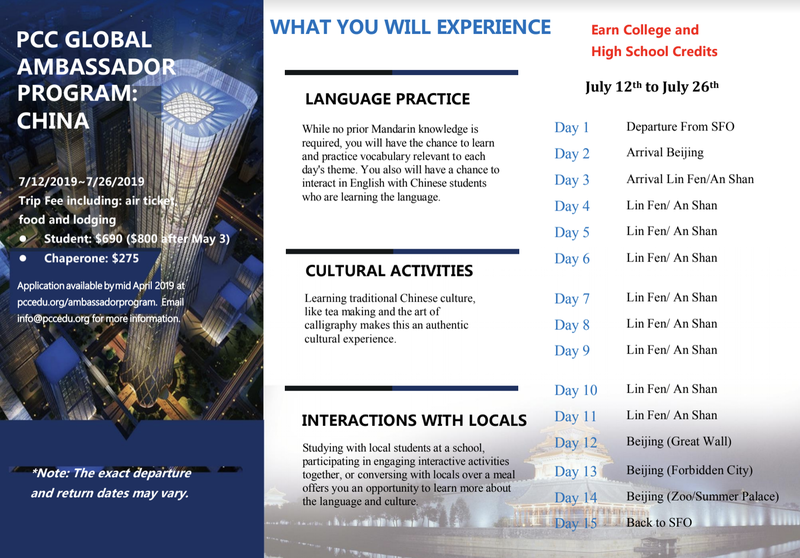 The WCCUSD is pleased to offer the China Global Ambassador Program again this summer. The main program dates will be July 12 to 27. The program for all groups will be approximately 16 days including travel. The program fee per student is only $690 ($800 for applications received after May 3). Fee includes flight, lodging, food, and activities. Passport, if needed, and a China visa are additional. The fee for chaperones is $275 (teachers preferred). Applicants will be notified of acceptance by May 15, 2019. High school & middle school students will again be able to earn 3 semester units of college credit which translates to approximately 10 high school credits. We will be taking at least 100 total students from District high schools and middle schools (for middle school applicants, 8th graders will be given preference). Each high school and middle school are allotted a minimum number of spaces in the program. We plan to take at least 20 chaperones. The groups will also do sightseeing to key Chinese cultural sites in the Beijing Area (Great Wall, Forbidden Palace, etc.). For the sightseeing portion of the trip, we are planning to be based in the same hotel as last year in the Beijing suburb of Langfang. This year, our main China location will change to the city of Anshan. We also will have a group of students/chaperones return to the same school in the city of Linfen where a group went last year. We will use an online application this year. PCC Education will make the final selection of applicants, but students will need the principal to sign off on them to be considered. While there is no firm GPA requirement, PCC will be looking to select students that have the academic and social-emotional skills necessary to represent our District well as student ambassadors. The online application will be available in mid-April at https://www.pccedu.org/ambassadorprogram. The application due date for priority consideration is May 3. Students are encouraged to fund raise to pay for the program fees. Scholarships are also available for qualified applicants based on financial need (there is also an option on the online application to donate to support scholarships). There will be in-person information sessions during the week of April 15. Please stay tuned for details. Any questions that students or parents have about trip details should be directed to the contact email on the flyer: info@pccedu.org. SAVE THESE DATES! WE ARE TALKING COLLEGE! Do you think know what your child needs during the high school years for success after graduation? We invite you to hear from a leading expert in the field of college admissions. His insight might surprise you! If you enjoy debating, acting, telling stories, or giving speeches, join our summer camps! We build your confidence through fun activities so you can share your voice with the world. Spaces are limited, so register today at https://www.practice-space.org/event-directory/. Young Speakers Camp, Ages 8-11, June 17-21, 8:30am-2:30pm. This one-week camp for elementary students builds confidence through presentation, basic debate, and storytelling, with games imagination and fun. Learn to speak your mind, tell your story, and listen to what others have to share. This camp helps students of all levels, whether they are shy or outgoing. Middle School Speakers Camp, Ages 11-13, June 24-28, 8:30am-3:30pm. This one-week camp for middle schoolers is for beginning debaters and actors who want to develop confidence and improve their speaking skills. Choose between basic debate or dramatic monologues, so this camp helps you whether you are more argumentative or more creative at heart. This camp is a good option for those who want to try public speaking through a gentle introduction. Persuasive Debaters Camp, Ages 13-18, July 22-26, 8:30am-3:30pm (optional add-on week: July 29-August 2). This in-depth debate camp builds skills in argumentation, logic, and strategy through parliamentary-style debate. It is helpful for students interested in debate competitions during the year – sign up for 1 week of classes or 2-week option with advanced practice rounds. Confident Communicators Camp, Ages 11-18, August 5-16, 8:30am-3:30pm. This two-week camp helps middle and high school students express themselves and find their unique voice. Choose to major in persuasion and debate, performance and acting, or podcasting and storytelling. Meet students from all over the Bay Area and receive lots of coaching to improve your skills. 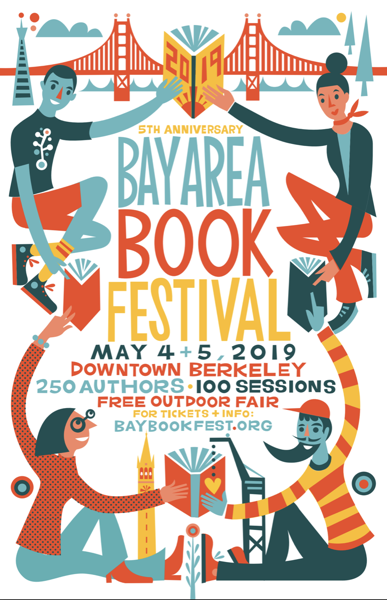 The Bay Area Book Festival is celebrating its 5th Anniversary on May 4-5 in downtown Berkeley with more youth and kids programming than ever before. With over 250 authors, there are exciting programs for everyone in the family. The festival’s Free Outdoor Fair showcases live literary presentations on four stages geared toward families, children and young adults; independent booksellers and book artists, literary organizations and writing associations, educational institutions, libraries, publishers, and scores of emerging authors from a range of genres; the ever-popular free book giveaway sponsored by Half Price Books; cozy reading lounges; Literary Death Match ─ a thrilling, humor-centric competition between established and emerging authors; and a delicious food court. Children of all ages will flock to an interactive Family Fun Zone for DIY book and journal making, arts & crafts with found objects, mind games, robot building, and more. Two-time Grammy-nominee for “Best Children’s Album” Alphabet Rockers returns for another inspiring program of hip-hop, craft-making, and community action. Also performing live shows both days of the festival, the beloved Oakland-based group sparks an intergenerational conversation about the world, creating a soundtrack for social justice. Help spread the word to your students, educator networks, parents, and young friends. Please use our Marketing Toolkit with poster art, graphics, social media copy, and more. We look forward to seeing you at the Bay Area Book Festival! LAST CALL FOR FINGERPRINTING FOR THIS SCHOOL YEAR! We are getting close to the end of the school year and our volunteer process will soon close for the 2018-2019 academic year. Our last day for volunteer applications will be on May 13, 2019. The last day for fingerprint appointments will be on May 16, 2019. We will resume the volunteer process in August 2019, day to be determined.